KABUL, Afghanistan — When he walked in to the peace jirga tent, President Karzai took up his place in the front row – in a very comfortable looking arm chair. To his left and right, Afghanistan's elder statesmen. Most had long white beards; a good handful were former warlords. Karzai had come to hear what the 1,600 delegates he'd invited were recommending he do to make peace with the Taliban. He'd had a lukewarm reception when he inaugurated the event three days earlier. It was, however, not as frosty as the reception the Taliban gave him. A serenade of rockets and gunfire greeted his opening speech. One rocket landed just 200 meters away. The top Taliban commander in the southern Afghan city of Kandahar has been killed, NATO-led forces said Friday. 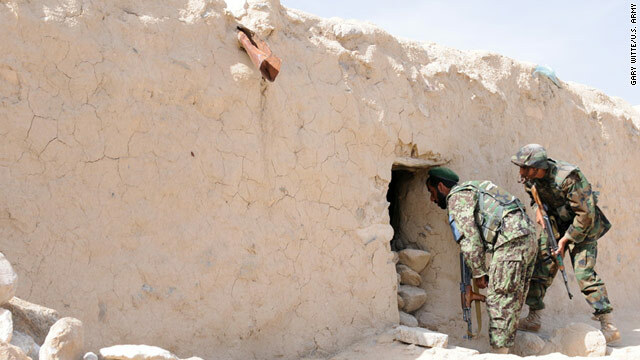 Mullah Zergay directed insurgent activities in two districts of Kandahar province, including the city of Kandahar, said a statement from the International Security Assistance Force (ISAF). He was killed in a raid last week in Zhari district. U.S. Army soldiers along with Afghan National Army and International Security Assistance Forces recently traveled through the Laghman province, meeting with villagers, inspecting schools and conducting security patrols. To help stabilize the region, the team's mission is to help encourage the local population to participate with their provincial government as well as build and repair the local infrastructure. The eastern Afghanistan province‘s economy was destroyed during the war with the Soviet Union, but it has growing agricultural and mining industries. Delegates to a peace conference in Afghanistan asked Friday that Taliban prisoners be freed from Afghan and international detention centers. They also urged the Taliban to cut its ties with al Qaeda. The suggestions are among 200 that delegates to the conference, or jirga, made to authorities.